Caribou are easy animals to hunt. The Alaska Range has many different herds on both the north and south sides of the mountains all of the way from the western end of the range to where it tails off near the Canadian border. Caribou are the most heavily utilized ungulate in Alaska and have been for thousands of years. The Nelchina caribou herd, close to the population centers of Anchorage and Fairbanks, is the most targeted herd in the state. I normally take my caribou from the Denali country. Many years of success have made me somewhat lackadaisical in my approach to the hunt. This season, the early closure to the first permit hunt caught me unaware. I left our place in Delta Junction and headed for our home base on the Maclaren River. Naturally, my rifle was in the truck, along with a couple of shotguns. It wasn't until I reached the Denali Highway that I realized I had brought no shells for my rifle. Fortunately, there were two cartridges in the magazine. I had no hunting knife. However, since it was just caribou, I figured that my three-inch pocket knife would suffice. I retrieved the binoculars from the door pocket of the truck and cleaned the sticky, kid-generated film from the lens. Darn. I still couldn't see through them. Good glass and a decent knife are important prerequisites to a caribou hunt. The two cartridges had become the least of my issues. Things appeared to improve after reaching our cabins. The river boat slid easily on rollers into the Maclaren. I soon discovered my chest waders, which had worked the previous couple of months in Bristol Bay, were now leakers. Oh well. The dog jumped in the boat, ready to go. I grabbed a blue tarp, just because, and fired up the reliable 70 horse. Idling was fine, but as I cracked the throttle, the outboard sputtered and quit; there was water in the fuel. I carry good tools. It took a short 10 minutes to clean the carbs and I was again off and running. Ten miles down the Maclaren the river braids into a sand flat. Caribou like the area because the sand bars are generally bug-free. Today, there wasn't even an old track in the flats. The Maclaren turns rocky after a few miles of sand. I continued down for 10 or 15 more miles before wheeling the boat into an eddy on the south bank. This section of the country has several dry lakes and numerous sand blows that caribou frequent. I walked for an hour or more checking caribou trails. There was not a track that had been made in the past 10 days. I stopped on a small sand blow to scan with my rifle scope. This was a beautiful spot to see from and the weather was fine. Caribou or not, I was having a great day. I called the dog, and as I leaned to pet him, something in the sand caught my eye. It was the edge of a rock that did not seem to belong. I brushed some sand away. My breath caught. 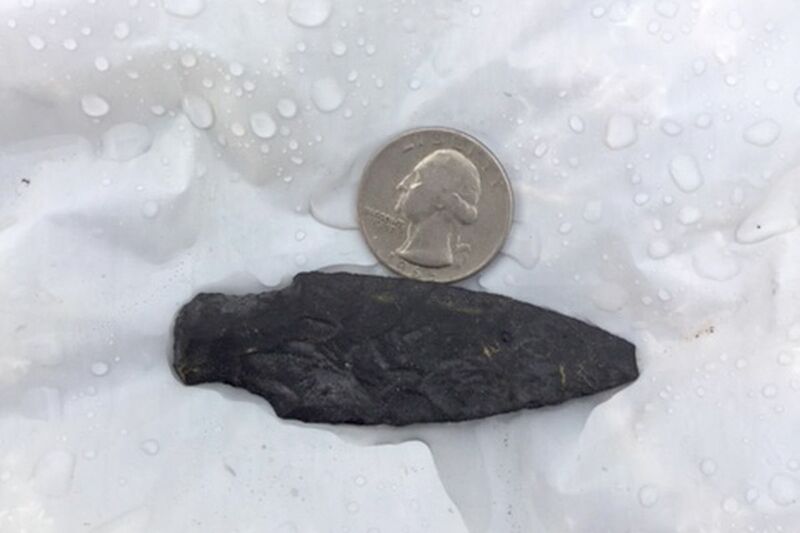 It took a moment to realize that I was looking at a 5,000-year-old spear point. I was not the only one who hunted here. The hair stood on the back of my neck. I looked over my shoulder. There was no ghost. I have walked thousands of miles in the back country. My only experience with this was a photograph. It is quite a different feeling to stumble on an ancient tool and hold it in your hands. The tip was broken very slightly. The hunter had not retrieved this animal. 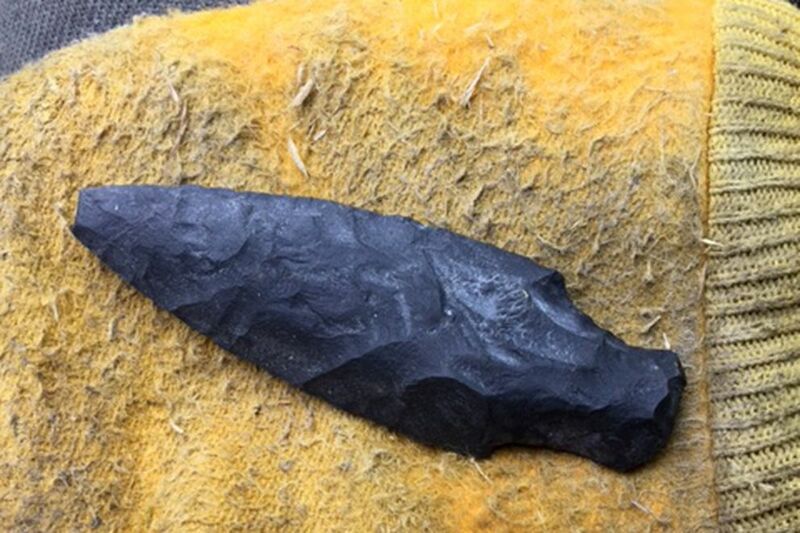 There was no way an ancient hunter was going to leave a valuable spear point behind. I tried the edge of the point on a plastic bag I was carrying. The cutting edge sliced through the bag like it was non-existent. My knife, though quite sharp, was by comparison a distant second. Toss your knife on the ground and leave it for a few thousand years. No one will find it. The knife blade will be just a rust spot. Hmm. I wonder who has the better tool? My .300 Winchester Magnum will reach out several hundred yards to take a caribou. To take a caribou with a stone point would have required the hunter to be within a few yards. Which of us is the better hunter? Discovering such an old tool carries with it a certain responsibility. Should you leave it where it rested for uncounted seasons, or bring it to show others the incredible craftsmanship and perseverance required to make one of these points? There is no right or wrong decision; both paths have merit. Men have hunted the caribou of the Alaska Range long before our Department of Fish and Game tagged them as the "Nelchina herd." Men will hunt them after all of us are gone. The present state of the world leads me to believe that in the not-so-distant future, we may again be hunting them with sticks and stones.